“Kort” is Lambchop front-man Kurt Wagner and country singer Cortney Tidwell. Invariable Heartache sees them celebrating the record label Chart by covering 12 songs from the labels output in the 60s and 70s. This is proper country music, not the “alt” variety that Wagner is usually associated with. The artists that originally recorded the songs aren’t household names, and the songwriters may have written some classics for better known artists, but I didn’t recognise a single name in the liner notes. In many ways that is the point of the album, Kurt and Cortney picking songs that they love and showing the listeners of today just how good the songs are. Musically the record is first rate, the band (featuring several members of Lambchop) plays the tunes brilliantly and the production is timeless. Listening to ‘Pickin’ Wild Mountain Berries’ you’d struggle to pin-point when in the last 50 years it was recorded, the only giveaway being Wagner’s distinctive vocal style. Vocally the recordings are pretty great as well. Wagner’s soft, slightly cracked, voice being complemented by Tidwell’s more traditional country style. Wagner has lost some of the vocal versatility he had when Lambchop were at the height of their powers but Tidwell is more than capable of belting them out and can sing the softer numbers with subtlety as well. Where the album falls down a little is on the basic quality of the songs being sung. There are no duff numbers on the album, but few classics as well. The overall standard is good, but it is easy to see why the output of Chart has been largely forgotten if these songs are the best that the label had to offer. That said it is an enjoyable album that showcases a nice variety of styles, from the upbeat country rock’n’roll of the aforementioned ‘Pickin’ Wild Mountain Berries’ to the soft bar room balladry of ‘He’s Only A Memory Away’. It is the kind of album that you can stick on, sit back and enjoy for the length of the 12 songs, but not one that you are likely to be cherry picking for your iPod playlist. The partnership of Tidwell and Wagner is an effective one and I’d love to hear what they might produce on a collaboration showcasing their writing talents as well as their singing. First Ringo Starr told fans not to bother writing fan mail to him and now Rufus Wainwright is moving in on the ‘don’t flatter me’ market. In a message on his website to accompany his forthcoming tour he has asked his fans not to applaud him during the first half of the set. "Don't even think about clapping"
He does go on to add that the audience are allowed to show their pleasure at being entertained by such a diety during the second half. “After a brief intermission, Rufus will return for the second part of the show during which you may applaud to your heart’s content. Please also refrain from photography during the first set,” the website adds. Strangely he offers no instructions for those wanting to boo him during this first half pretentious-a-thon. 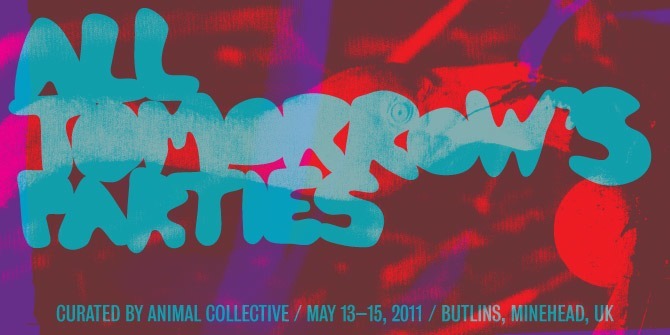 Animal Collective have been confirmed as the curators of the May 2011 All Tomorrow’s Parties festival weekend. Unlike previous years there will only be one weekend ATP festival in May. Much loved by the critics, their 2009 album Merriweather Post Pavilion made it in many of the ‘best of 2009’ lists, the bands sound is a mix of psychedlia, electronica and Beach Boys influenced pop. The line-up of the festival is sure to be an eclectic, left-field mish-mash. The weekend will be held on the 13th to 15th of May at the Butlin’s Holioday Centre in Minehead. Tickets go on sale on Friday 29th October. For more details go to the ATP website. There are many like The Robot Heart that fit into the so called nu-folk bracket, but unlike , say Mumford and Sons, this act manage to take folk to new, more mainstream levels and crucially retain credibility. This credible nu-folk arena is fast becoming a busy place, with fellow Brighton acts like The Miserable Rich and Leisure Society doing well. The Robot Heart are a more than welcome addition. Why the praise? Well, from the beautiful arranged harmonies on opener ‘Raining Stones’ to the heartbeat rhythms of standout track ‘Lost In Stereo’ it’s clear this is no ordinary act. The mix of chamber pop, choral harmonies, epic film score quality and down to earth folk is exceptional but like all good ideas based on simple foundations. Just a twinkle of acoustic guitar here, a basic piano melody underpinned by subtle brush drummed percussion there. Its simple but remarkably effective in creating a sense of mood. The track ‘The Robot Heart’, is a case in point with its wintry feel and sounds a little like Tuung at times. Final track ‘Singing To The Ghost’, which is one of three acoustic tracks to round off the EP, is another standout that retains an epic quality despite its more low key production. As an EP Dust is perhaps the biggest tease of the year, leaving me full of anticipation for their first full length debut, which is due out next year on their label Bleeding Heart Recordings. The mystery behind Coldplay and Snow Patrol’s popularity has been revealed. According to a survey by hotel chain Travelodge the main reason the bland stadium rockers’ albums are being bought is that they send people to sleep. The survey asked 6,000 people what music they listen to at bedtime to help them sleep. Coldplay came top, followed by Canadian singer Michael Buble (I remember when he was plain old Mickey Bubbles) and Snowpatrol. Earnest festival headliners Radiohead also make the top ten, although the dreams some of their recent albums would induce does not bare thinking about. A point of reference is such a useful tool when reviewing a new or emerging band. Just what do this lot sound like? Rarely a band comes along with no comparison, and then a band like Cygnets, from Alberta, Canada, emerges with points of reference in spades. From their publicity blurb this three piece compare themselves to The Smiths, Joy Divison and Depeche Mode and a whole bunch of genres from dance music to post punk. I can see some of that there on their debut album Bleak Anthems, with Depeche Mode dominating the first half and more guitar acts the second. While the first half contains the tracks the band clearly think are better (their press release urges us to listen to three of the first five tracks if nothing else). For me though the 80s Final Countdown style synth parts are a bit jarring and samey. Like Muse on a budget. It is the second half where the album really takes off. I’m not sure why, but from track seven ‘Let’s Make A Video’ onwards the synth takes a back seat, guitar comes to the fore and the band really benefit from it. This better second half still sounds 80s, but more like say New Order at their most riffy, or New Zealand new wave veterans The Clean. Even the vocals sound 80s. The points of reference continue, but closer to home. Canadian electro-pop legends Men Without Hats is an obvious comparison. Not so much their mega hit Safety Dance, but stuff on their album Folk of the 80s. Others are Sunset Rubdown and Wolf Parade, who like Cygnets use cheesy 80s sounds but still retain credibility. Bleak Anthems is available for free download from the band’s website here. Lack of toilets has been revealed as the reason for Glastonbury 2012’s cancellation. Festival organiser Michael Eavis says that demand and cost for toilets during the year was too great as the UK is also hosting the Olympics in 2012. In an interview with the Daily Telegraph he revealed that: “We only own half the loos we actually need every year. We shop around with four companies to get the best price, but we are not bothering for 2012. He added that local constabulary Avon and Somerset Police had also warned him that they would not be able to provide the same number of officers to oversee the festival due to Olympics commitments. The decision to name 2012 as a fallow year for the festival had been made some time ago, but this latest story sheds more light on the factors behind that decision. The festival usually takes a break every five years. A rare White Stripes single has sold for £11,000 ($17,000). The deal was made through Jack White’s Third Man Records. The expensive purchase was a copy of the band’s second single ‘Lafayatte Blues’, which has a cover hand painted by White and Italy Records boss Dave Buick due to a delay in printing the actual covers. Just 15 copies had these covers and all were originally sold at a gig in Detroit in 1998 for just £3.50 ($5.50) each. Since that gig and prior to this latest sale just two have been resold. One sold in 2003 for £500 ($789) and another a year later went for £1,000 ($1700). This is still not the most valuable Jack White record. While working as an upholsterer and performing in a band called The Upholsterers Jack sealed up 100 copies of an EP by the band in furniture. None have yet emerged. We were first alerted to Memphis based Goner Records last year when listening to Alice and Friends the debut album by Box Elders, one of the newest bands on their roster. The Box Elders brand of 1960s style DIY punk, humour and having a drummer who could drum and play keyboards simultaneously enthralled us. As we looked into the label further we discovered a treasure trove of the unusual, the classic and above all garage punk. Here’s a bit of history about the label to set the scene before we give you a run down of some of our favourite Goner acts. Goner Records launched back in the early 1990s by Eric Friedl in Memphis, Tennessee, to showcase music by his own band Oblivians and other garage punk outfits of the time. With the late Jay Reatard among the first on its roster the label, which is co owned by Friedl and Zac Ives, has grown steadily over the years, taken on artists around the world but steadfastly stuck to its garage punk and Memphis roots. It how hosts an annual Goner Fest in Memphis and runs a record shop in the city. For more information about Goner visit here. We are also running a competition to win a DVD and CD from the label’s 2007 Goner Fest. Click here for more details. Brothers Clayton and Jeremiah McIntyre are the driving force behind Box Elders, forming the band in their native Omaha Nebraska. Dave Goldberg, who plays drums with one hand, keyboards with the other on stage is the third member and gives the band a real difference to others. Their music is basic, but full of fun and the cheap production gives it a sixties feel that many other bands spend a fortune to emulate. They just throw it together and it comes out just fine. To read our review of Box Elders’ debut Alice and Friends click here. Chicago garage punk outfit CoCoComa was started five years ago by husband and wife Bill and Lisa Roe and have since been joined by keyboardist and bassist Mike Fitzpatrick. They claim that they ‘don’t practice much and should probably start wearing ear plugs,” in their publicity blurb. Maybe consider the latter but more practice could spoil the raw edge that this fiery band have in their sound. This trabadour style singer songwriter could be any age between 20 and 80. His music is timeless, mixing classic rock n roll with punk and folk expertly. Love drives this man and none more so than on 2010’s Sucker, which as he says on the sleeve notes, was “mostly written while courting an adventurous woman and following her around the world. The courtship was a success.” Sucker is an eclectic and heartwarming album and would be a welcome addition to any CD collection. Goner has really extended its reach with Eddy Current Suppression Ring. The Melbourne act have been going for around four years and with 2010’s Rush To Relax have created one of the most unusual sounds in garage punk. At times silly, they blend a sound akin to early Buzzcocks with the tribal drumming of The Monks, all wrapped up into a very Australian sound. Garnered with praise by Australian radio stations such as Triple J, they are still pretty unknown outside Australia. In fact they are still pretty unknown in Australia, despite have the cool swagger of a far bigger band. For a review of Rush To Relax click here. With Lisbon US band The Walkmen have delivered a perfect follow up to their last album You and Me, which topped our Top Ten Albums list for 2008. Retaining You and Me’s stripped back, timeless production with nods to the 50s and 60s, Lisbon has plenty more goose bump moments and once again offers a perfect showcase for lead singer Hamilton Leithhauser’s stunning rock vocals as well as the band’s love of vintage instruments. There’s even more of an epic feel at times on Lisbon than You and Me, with the slowed down, mariachi feel of ‘Stranded’ showing a band that is maturing nicely. Before You and Me the band were perhaps best known for the single The Rat, a rollercoaster of indie rock with no let up. The consistency of You and Me changed them into far more of an album band. Lisbon also has not one single duffer across its 11 tracks. It also has a couple of new rivals to The Rat, as well as You and Me’s standout In the New Year. Lisbon’s ‘Angela Surf City’, with its powerful build up is easily a match, as is the anthemic ‘Victory’. Both are sure to be new crowd favourites. There’s a nice arc to the album as well, Juveniles being the scene setter, with its passionate vocals and vintage guitar twangs. High quality indie rock takes over on ‘Angela Surf City’ and ‘Victory’ and then for the final few tracks the pace slows down until the title track rounds things off . Among these final tracks ‘While I Shovel the Snow’ is the most meloncholy. The consistency and sense of emotion conveyed on Lisbon have prompted another high score from us and I’d be surprised if Lisbon doesn’t make not just ours but many other best albums of year lists come December.